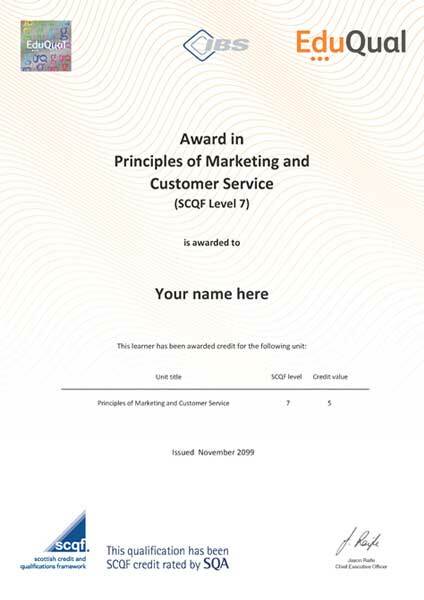 The Award in Principles of Marketing and Customer Service (SCQF Level 7) is a 5 credit size qualification with one unit and is a Regulated Qualifications Framework (RQF) equivalent Level 4 award. This award allows learners to learn, develop,improve and practise the skills required for employment and/or career progression in the marketing sector. Also this course is for anyone wishing to improve their knowledge of the importance of customer service including how to satisfy customers expectations. Finish in 9 Months. If you can spend about 2 to 3 hours per week, use this option. - Pay in affordable monthly, quarterly and half yearly instalments. - Study material or e-library access available. Cost effective - Typically UK Degree starts from GBP £18000 per annum, but with online study, you can enjoy saving more than 60% on your educational investment. This qualification is designed for learners who are typically aged 19 and above.